"Move in the Changing Light" presents music of extraordinary beauty and subtle complexity - the premiere recordings of seven new works by composer Phillip Schroeder that range in character from lush lyric counterpoint to shimmering multiple-piano textures. Schroeder is featured on piano, synthesizer, electric bass, and percussion, along with baritone Robert Best, whose voice critics have described as “magnificent,” cellist Daniel Cline of the Arkansas Symphony and Rockefeller String Quartet, and the young lyric soprano Amy McGinty. Schroeder has been a featured composer, lecturer, and performer at music festivals, conferences, and universities throughout the United States and Europe, and he has performed his own works on more than 150 concerts. His music has been described by critics as “expansive, lyrical sound-worlds,” “wonderfully evocative,” and having "brilliance and openness" with "powerful expressive qualities that focus on subtle shadings and nuances." Draw the blinds, draw a bath, and let your mind take this gentle voyage. Phillip Schroeder breaks down many of the conventions related to Chamber Music and expands the most symphonic side of Ambient, and, taking those motivating elements, he then shapes structural designs on which is built a very personal style, generous in complex architectures as well as dream-like atmospheres. Phillip Schroeder uses multiple pianos and digital delays to generate dense masses of shimmering trills and cascades that create a complex calm and openness. This music pours the listener into a meditative and serene mood and wraps them soundly within the safe confines of its language. If you want serenity, you need not buy a single other CD in your lifetime. “The Year in Music” 2007 His most recent CD, Move in the Changing Light (Innova ) is melodic, contemporary music that would be enjoyed by fans of Philip Glass and the new music spotlighted by the ECM label and Kronos Quartet. This Arkansas-based composer lists among his many inspirations Taoism and the overtone series, and the former may well have a direct bearing on Schroeder's use of the latter on this collection of chamber pieces. Schroeder plays the bulk of the instrumentation:synthesizer, electric bass, vibraphone, suspended cymbal and (multiple) pianos. Soprano Amy McGinty, baritone Robert Best and cellist Daniel Cline make valuable contributions; the singers are particularly luminous, often suggesting Gregorian chant, and McGinty's multi-tracked vocals on the opener are just gorgeous. But the players ate almost overshadowed by the electronic processing that transforms Schroeder's rippling, cascading clusters and intervals into shimmering dances of light on a stream. These meditative, deeply spiritual pieces evoke Debussy and Satie in their spare phrasing, and their use of repetition also ties them to the work of the Minimalists; yet they have a Romantic sweep that points in an entirely different stylistic direction. 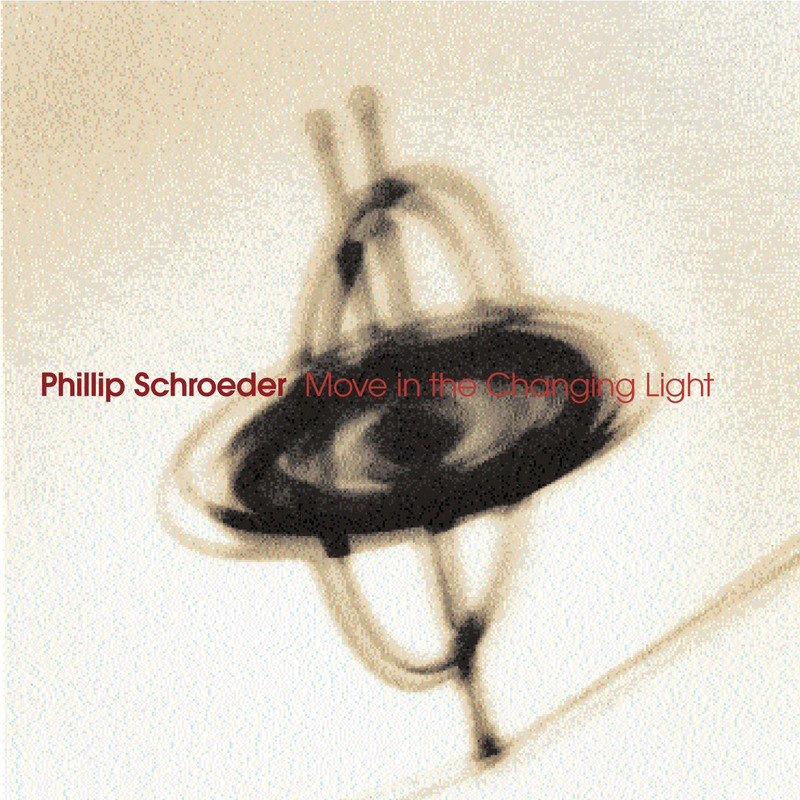 “Move In the Changing Light” is a fascinating new release from Phillip Schroeder. Ambient and experimental, this music would very definitely fall under the category of “contemporary classical.” ... The sound is rich and full, and the complexity is subtle. ...The piano sounds are made up of layers, some a rapid filigree effect, and others more floating. The ethereal soprano voice combines to create a feeling of vast space and sparkling light. ...Far from ear candy, ...if you are interested in something different and substantial, I highly recommend it.
. . . fascinatingly complex yet accessible . . . Among his influences the most significant are Taoism and daily meditations, clearly in evidence on the latest CD of premiere recordings of seven new works. Phillip Schroeder’s ethereal music . . . is wonderfully opulent and rich in subtle detail. Throughout Move In the Changing Light's seven pieces, composer, performer, and Music Professor Phillip Schroeder generates dense masses of sparkling trills and cascades by not only using multiple pianos on a given piece (five on “Move in the Changing Light 2”) but by then applying digital delays to them. The sound that results verges on paradisiacal, especially when the heavenly keyboard textures are joined by the angelic (multi-tracked) vocalizing of Amy McGinty. Despite the detailed patterning of the pianos, Schroeder's music exudes an entrancing calm and openness, as modulating tones bleed slowly into one another. Aside from the metronomic ticking of a vibraphone, “Rising, See the Invisible” is not so much dissimilar compositionally to “Move in the Changing Light 2” as it is sonically with Robert Best's baritone and Daniel Cline's cello imbuing the meditative piece with a darker, ruminative ambiance. Scored for multiple pianos and digital delays only, “Where Joy May Dwell” presents Schroeder's style most nakedly and, at sixteen minutes, allows the composer ample opportunity to let his music unfurl unhurriedly. An interesting tension shadows the piece, as the piano's hard definition pushes up against the impressionistic interweave of the composition itself, plus an analogous tension emerges between its single note accents and trilling clusters. Even more interestingly, conventional adherence to a four- or eight-bar phrasing is banished as a given tonal mass extends and then briefly expires before another continues the pattern at a different pitch or key. Though Move in the Changing Light would likely be categorized as 'contemporary classical,' it possesses none of the atonal and intellectually austere character that a description of that kind might connote for some listeners; instead, Move in the Changing Light is remarkably soothing (especially “This We Have,” whose restrained instrumental arrangement allows McGinty's voice a chance to shine)—which shouldn't be construed to mean vapid, by the way, as Schroeder's glistening pieces are full of elegant nuance.
. . . you’ll keep hitting repeat on your CD player. Imagine one of those arching, mesmerizing phrases of classic Philip Glass process music breaking off from the larger pattern and forming a blissful, spinning eddy curled in upon itself. Much of Phillip Schroeder’s music on this album sounds something like that.